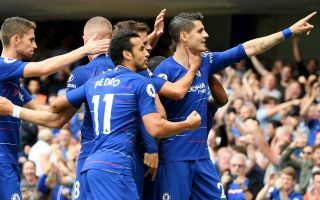 Chelsea striker Alvaro Morata has set himself the target of scoring 30 goals or more in the 2018/19 season. This seems a tad ambitious for the Spain international, who has not had a good 2018 at all so far, and who would need to double his tally of 15 from last season in order to achieve that aim. Indeed, Morata has never managed more than 20 in a single campaign, and that came in his final season for Real Madrid in 2016/17, when he worked quite effectively as a super-sub option from the bench. When starting regularly, however, he has seemed to struggle, with his spells at Chelsea and Juventus looking less productive for the 25-year-old. Still, perhaps Morata feels he can improve under new Chelsea manager Maurizio Sarri, who has the team playing an attractive brand of possession-based, attacking football at Stamford Bridge. This could boost the chances Morata has to stick the ball into the back of the net, unlike in Antonio Conte’s dysfunctional side of last season. ‘The last year was very hard for me, not just with confidence. The injury was very bad for me and my head, but when the ball goes into the net everything changes. Your mind isn’t blocked anymore and I hope now I can score a lot of goals,’ Morata is quoted in the Metro.